I know you need an update on these things… turns out the frozen logs of 100% Whole Wheat Chocolate Chip Cookie Dough bake up just as well as the fresh dough. 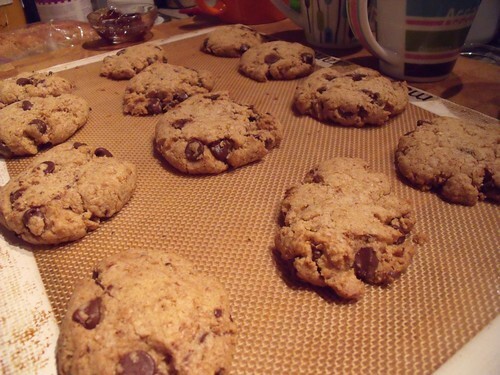 Which is the perfect reason to always have fresh-out-of-the-oven chocolate chip cookies on hand. And they’ve got fibre, so they must be good for you! The baking time doesn’t even need to change – 20 minutes (with one tray rotation midway through) at 350F, easy as pie cookies. Just like we have a house wine around here, we now have a house cookie. And if you’re keeping track from last time, I did “smush” these cookies and they worked out much better than the un-smushed, domed, risen ones. I was thinking about some exciting additions (I love orange zest in chocolate chip cookies), but I might not get there, because these have so much flavour just the way they are. 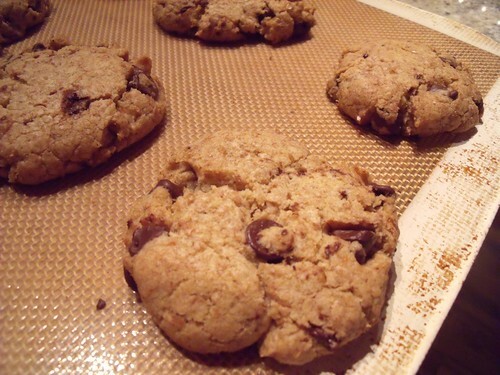 It’s the whole wheat flour, it makes such a difference! I even served them as dessert to friends last night, so you know they’re good. Plus, who doesn’t want to treat their friends to the smells of cookies in the oven? An actual healthy & delicious recipe for one of my favourite Spring dishes is coming later today, promise. Oh boy! Those are amazing. I was going to say that the original ones looked great, but these look even better. I’m always afraid to use whole wheat in cookie/pastry recipes because people might think they are too “healthy” but I’ll have to definitely try these! Thanks, Daniel — I’m so impressed with how well they baked out of the freezer! You MUST try them, they are so worth it!